Other firms have agreed to spend more than $35 billion over issues tied to the 08 financial crisis. The Morgan Stanley deal comes more than six years after the market crash. Morgan Stanley (MS) has agreed to pay $2.6 billion to settle probes into its creation and sale of residential mortgage-backed securities, as the U.S. Department of Justice holds another large Wall Street firm to account for the 2008 financial crisis. The firm increased legal reserves related to mortgage matters by about $2.8 billion, cutting 2014 income from continuing operations by $2.7 billion, or $1.35 a share, Morgan Stanley said Wednesday in an annual regulatory filing. It’s the fourth time in the past five quarters that the New York-based bank reduced earnings in the weeks after announcing them. JPMorgan Chase (JPM), Bank of America (BAC) and Citigroup (C) — the three biggest U.S. banks — previously settled with federal and state authorities over the probes, agreeing to pay a total of more than $35 billion in cash and consumer relief. Goldman Sachs Group (GS) disclosed this week that it received a letter from the U.S. Attorney’s Office in Sacramento, saying a civil lawsuit may be brought against the firm. Patrick Rodenbush, a Justice Department spokesman, declined to immediately comment about the settlement. 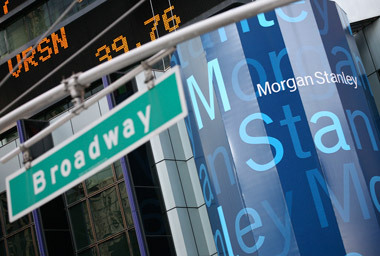 The agreement follows other regulatory actions against Morgan Stanley over similar allegations. The firm last year agreed to pay $1.25 billion after the Federal Housing Finance Agency accused it of selling faulty mortgage-backed securities to Fannie Mae and Freddie Mac. In July, Morgan Stanley reached a $275 million settlement with the Securities and Exchange Commission over claims it understated the number of delinquent loans backing subprime mortgage securities.